Throughout the 1970s David Bowie’s outstanding and groundbreaking creative output was legendary, with most lifelong fans proclaiming it as his best period. There were a few hits and misses over the following decades, but any new release was always interesting, if occasionally disappointing, only because of the unbelievably high standards achieved in the past. On January 8th 2013 we witnessed the start of one of the biggest comebacks in music and entertainment history. After a prolonged period of silence with only a few rare appearances and sightings, David Bowie had announced a new song and video on his sixty sixth birthday, taking the general public and music industry by complete surprise. In a day and age where you can feed the cat whilst at the the same time checking out a leaked mp3 via social media of a minor celebrity hiccuping into a empty jam jar, one of the greatest and most important recording artists in history simply released his first new work in a decade, ‘Where Are We Now?’ When I clicked on the link for the video and heard the opening piano chords I thought for a few seconds that it might be just another ballad, until the lyrics kicked in referencing places and streets in Berlin, recalled from his time living there circa 1976-79. To evoke the atmosphere from his greatest creative period in a new song made it all highly emotional and his reflective expression in the video all combined to make an incredibly fragile and moving piece. The album that followed, ‘The Next day’ was indeed a complete return to form invoking classics from ‘Low’ through to ‘Scary Monsters (And Super Creeps)’. I was really happy he was back and felt that if there was another album to come and it was anywhere near as good then we could look forward to a long lasting exciting new phase from a resurgent, rejuvenated and seemingly happy (but still dark) Bowie. For the next album you wouldn’t expect the same surprise impact that walloped us in 2013, so there were a few early snippets of information including Bowie’s co-producer Tony Visconti announcing: “It would be different and original, unlike The Next Day which gave a good nod to past glories”. “This is fresh, this came from a different space”. So, after watching the video clip for the title track ‘Blackstar’, I decided I did like it but wasn’t completely sure how much. 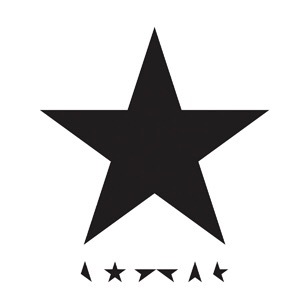 However, over the next few weeks it started to invade my head and the manic repetition of ”I’m a blackstar” backing vocals wouldn’t give me any peace! Then came the ‘Lazarus’ clip which was a bit unsettling with a tired and fragile looking Bowie talking about heaven and bluebirds in an isolated asylum crypt-like setting brimming with symbolism. Again the track took time to convince me but it proved to be just as infectious if not slightly more disturbing. (★) is a record I’ll only ever play when there’s time to really listen to it all in one go. I think it’s going to be one of my all time favourite albums, yet it’s mixed with so many questions and conflicting emotions which make it not a wholly joyous experience. It will have a time and place and you just have to be in that moment. I was going to write about all the tracks but I see it more as an overall statement. Was it a parting gift or a body of work from a creative genius trying to move onto the next batch before it was too late? (Visconti has said there are later demos). We might never know.. I’d like to look on it as yet another masterpiece, albeit the last.